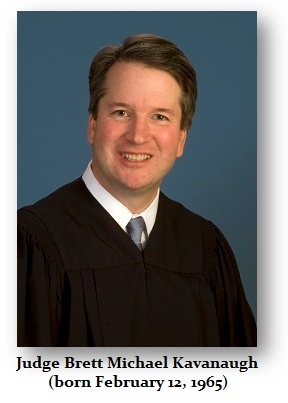 QUESTION: What is your opinion of Trump’s Supreme Court pick? ANSWER: The main decision that I believe allows us to pierce the veil of judicial reasoning is Susan SEVEN-SKY v. Eric H. HOLDER, 661 F.3d 1 (2011). In this decision, Judge Brett Kavanaugh did not join Silberman’s opinion. Instead, he wrote a sixty-five-page opinion that argued that the court could not even decide this case. In other words, his dissenting opinion deliberately did not resolve the case on the merits. What is more disturbing is his reliance on an 1876 law that has effectively placed government rights above that of the people. This I find VERY disturbing. Judge Kavanaugh’s opinion was based on the 1876 law called the Anti-Injunction Act (AIA) that applied to the tax code, which I would argue is unconstitutional on its face. A court cannot raise arguments not raised by the parties, but it has a duty to first determine if the court has the jurisdiction to hear the case. It was down this path that Kavanaugh took a stroll which is rather disturbing for his conclusions. The government did not rely on this provision of the tax code with respect to jurisdiction. Few people ever heard of it. It appears he search the universe to find something that he could use to justify no making a decision of the merits. The purpose of the Anti-Injunction Act was to prevent taxpayers from challenging a tax in court before it is assessed. In other words, a citizen must first pay a tax under protest and then challenge it after the fact by seeking a refund, which presumes you even have the money to hire lawyers to TRY to get your money back. This effectively alters the entire legal system. You are entitled under EQUITY to seek an injunction to PREVENT a harm. Under this 1876 Anti-Injunction Act (AIA), the government gets to do whatever it wants and it can freeze all your assets and win by sheer oppression. An injunction is an equitable remedy in the form of a court order that compels a party to do or refrain from specific acts. A party that fails to comply with an injunction faces criminal or civil penalties, including possible monetary sanctions and even imprisonment. They can also be charged with contempt of court. Trust me, they can imprison you until you die for daring to challenge an abusive application of a tax. Congress can simply pass a tax saying anyone who has 3 children is promoting Global Warming and must pay 85% of all income as a tax for environmental compensation. Under the obscure 1876 Act, you can be imprisoned for life using contempt for even opposing the tax. That is not a free society! The Constitution under Article III created the courts and gave them the power under “law and equity” under Section 2. Consequently, Congress cannot pass any law that would negate the Constitution. Therefore, you have a CONSTITUTIONAL RIGHT to injunctive relief to PREVENT a harm. That is the entire purpose of EQUITY, to seek relief from the LAW when it is unreasonable. If the government seizes all your property under some tax statute, the 1876 Anti-Injunction Act (AIA) would then prevent you from hiring a lawyer, and in effect, you will be denied any redress in a court of law until AFTER they take all your money if you have anything left to hire lawyers. Therefore, I would bluntly disagree with Kavanaugh’s dissenting opinion. This is so pro-government and anti-human rights no less unconstitutional, it does not reflect a country a reasonable person would want to live. Because it was a dissent and not the majority of the court, then it did not take any effect. My concern is his willingness to allow Congress to circumvent the Constitution. If this statute was actually in play, I would argue it is patently unconstitutional for it would deny the application for equitable relief and overrule Article III.